A perk of my new job at a university is that I am given a certain number of vouchers that I may redeem against a variety of educational or sporting courses. I have decided to take an Open Studies Certificate in Journalism, a 25-week course that I hope will help me in both my full time job and in my freelance endeavours. The first term is on the subject of media writing, and we are given an assignment each week. My first week’s homework was to write a comment article on a topic that I feel strongly about, in 250 words – so here it is! This hasn’t been marked by my tutor yet, but I appreciate any feedback or comments! 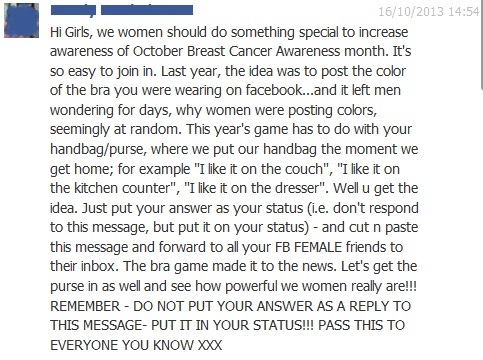 October is Breast Cancer Awareness Month – a fact that this Facebook chain letter (left) brought to my attention. Breast cancer affects approximately 1 in 8 women in the UK, as well as a few hundred men each year, and countless families are devastated by this disease. Although advances in diagnostics and treatments have reduced the number of people dying from breast cancer, charities such as Breast Cancer Care, Breakthrough and Cancer Research UK still play a vital role in funding research into the disease and supporting its victims. Which is why this chain letter annoyed me. Given the high prevalence of breast cancer, it is not breast cancer per se for which we need to raise awareness, but rather raising the profile of charities and encouraging fundraising, the importance of checking our breasts for lumps, and of visiting the doctor with concerns. Simply making someone aware of a disease that we already know about isn’t enough – we need to encourage positive actions. Posting a Facebook status that does little except to confuse the few people who aren’t in on the joke isn’t, in my view, a great way to make a stand. This October, might I suggest that you donate to a cancer charity, take part in a fundraising event, or even encourage your friends to check their breasts? This will raise far more awareness and do far more good than posting a Facebook status about where you leave your handbag. Edit: Thanks to Matt Kaiser (@marvel_matt) who spotted that I’d misquoted a statistic. In a previous version of this post, I erroneously stated that breast cancer affects around 1% of men, when in fact this should have said that less than 1% of all breast cancers are in men. I have updated the article above. Update October 28: Had good feedback from my tutor, who said I was “developing a great journalistic style”. He advised me to break my paragraphs down a bit more to make the article easier to read, and also to try and avoid repetition of key phrases; in this case ‘breast cancer’. The chain-letter game seemed pointless to me. (I have not had breast cancer, but my wife has). Your article seems effective to me, though a little short. But then I have no idea of the length required. “I really loved your piece, you made a number of relevant comments and a massive well done. I completely agree with your piece I don’t understand the benefit of keeping it a mystery. If I can help you with any more information about Breakthrough’s campaigns or what we do I would be really happy to help you.